So please be patient and take your time with your new and ‘unskilled’ French bulldog, and to help you we have put together loads of information on how to train your French bulldog. Crate training is when you confine your Frenchie to a crate when you are unable to directly supervise him. Also when you wish to teach your Frenchie to relieve themselves in the right area. Develop a daily potty routine that includes leashing your Frenchie as soon as you wake up and telling him or her “let’s go potty!” This will familiarise the phrase with your puppy when relieving itself. Take you Frenchie outdoors to where you want him to use as a bathroom. He may be easily distracted and want to play so make sure you are firm with your instructions. Praise your Frenchie with excitement when they relieve themselves in the correct place outside. If he does not “go potty” take him back into his crate and repeat every 10 minutes. Make sure you repeat this routine after each of your puppy’s meals, before you leave the house and first thing in the morning. Oh and do not forget to do this last thing at night too! Your Frenchies crate should have just enough room for him or her to turn and lay down. Dogs will not usually relieve themselves where they sleep (unless they are left for too long). 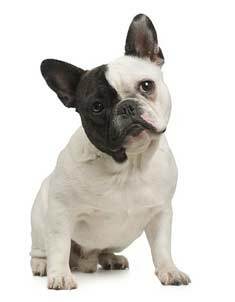 You can give your Frenchie a treat when he or she does well in potty training. But if your Frenchie has an accident in your presence then scold it and quickly move them outside. It is important to remember that your French Bulldog puppy has a small bladder. Make sure they have the chance to relieve themselves every 2 hours and at night when required. Please do not crate your French Bulldog puppy for longer than 4 hours when they are small. Do not scold your Frenchie if it has an accident and you do not witness it, it will only confuse them. Each time the puppy goes in the right spot, he is being trained to relieve himself there. Consistent training with your puppy will bring consistent results You may found it helpful to have an exercise pen for the house, and one for the yard. But please so not leave your Frenchie out in cold or alone in hot weather. Place the other exercise pen in the spot you wish your Frenchie puppy to use as a permanent potty spot, both as a puppy and adult. State commands like “go potty” or “hurry up.” After he does his duty give him a treat and tell him he was a good boy. Use your Happy Voice! If you provide your French bulldog puppy with a crate that is way too large then it may allow him to relieve himself in one end and sleep in the other which isn’t good! Make sure you take your Frenchie puppy outdoors to eliminate on a regular schedule and especially prior to being left for prolonged periods of time. He will start to circle and sniff and look for a place to potty when he has to go and when you are watching him, you can quickly take him to his potty spot. By watching closely, you will soon learn your puppy’s individual body language. Minimize his chances of making a mistake by predicting when he will need to relieve himself. If you are going to be playing and interacting with your puppy, then it is absolutely fine for him to be out of his crate as long as you like. Times to watch are : As soon as he awakens, as soon as he finishes a meal, first thing in the morning, after a play session, and as soon as you take him out of his crate. Do NOT let your puppy run lose when your eyes are not on him, even for a couple minutes. Each time your puppy has an accident, he is being trained to potty in that spot. 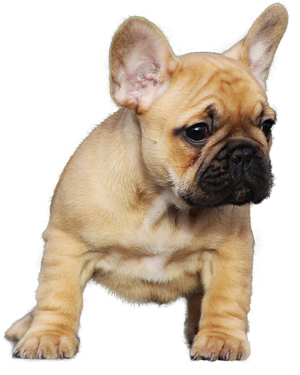 Make sure that you create a schedule that involves regular feeding times and meal times for your French bulldog puppy. We recommend that you should get the little guy out for a walk as soon as he or she wakes up, after play time and also after any eating or drinking. It’s good to remove your puppy’s water bowl a couple of hours before bedtime too. Confine your Frenchie if there is a chance that supervision is going to be a problem. If you limit your dog to a crate or confined space then they will refuse to relieve themselves in what they would see as living quarters or sleeping quarters. This also goes back to their clean breed set up. They don’t like eliminating where they lay. Keep your eyes peeled for any warning signs from your French Bulldog! They will include things like circling in the room, pacing around from one room to another, some sniffing about, whining, maybe even a little barking. Remember, if you spot any of these sure fire signs then immediately take your Frenchie outside to eliminate. Teach your Frenchie the “Go Potty” command. SO when your little chap needs the loo and starts to go where he/she shouldn’t, say “GO POTTY” and point outside or on the training mat. When they finish heap loads of praise on them while they are still outside or on the training mat and give them a little treat. It will not take long for them to get used to this command and eventually just go outside! Make sure all indoor “accidents” are cleaned away completely. You want to eliminate the odor of urine and feces around the house as when the dog smells this around the house he or she will be more inclined to use it to go to the toilet. A good tip is to remove the guys little accident into the back garden or yard and leave it out there, that way they can identify the spot with where to go potty. There are certain times in the day when your French Bulldog is more active so try and train your Frenchie when they are more alert – they pay more attention. Frenchies have an estimated 15 minute attention span so when you are training your little freind then make sure you keep that in mind as anything over this and he will already be losing his focus. If you schedule these little bursts of training sessions throughout your day, you will make more progress and keep these sessions happier for both of you. Make sure that you have established yourself as the Alpha leader with your Frenchie. They will always respond better to training when they know who is in charge at all times. This does not mean that you have to hurt or dominate your French Bulldog. It can be as simple as ensuring that you always eat first at mealtimes before giving him his food. Do not limit rewards to your French Bulldog to just when he follows your commands. If you see him doing good positive things reward him then too. He will catch on very quickly! Always use your French Bulldog’s name when you need to get his attention, like at mealtimes, playing, walkies etc. It will get him used to what he needs to respond to. When giving commands to your Frenchie make sure that you are serious at all times. Don’t let him ignore your commands otherwise you will have problems in the future. Do not reward or scold your French Bulldog for something they did 15 or more minutes ago. They will not associate the action with the event! They have terrible memories remember! Your Frenchie may do funny things that are also bad. You must still punish him for this and DO NOT LAUGH! This will only confuse your dog and make training harder down the line. If your French Bulldog is not obeying commands he may not be very well so be careful when dishing out punishments as you do not want to scold your Frenchie for being ill. If you suspect that your Frenchie is in fact unwell and not being a stubborn so and so! Get him down to the vet as soon as possible, and get him checked out. Some French Bulldogs find collars and leashes uncomfortable and may play up when you put them on, so make sure you use collars and leashes from a small puppy. To avoid any episodes outside with leashes, put a leash on your Frenchie around the house a few times before your first trip outdoors, it will help the whole thing go more smoothly. Positive interaction is one of the most important and basic needs of a French Bulldog prior to training him. Greet him with lots of attention whenever you meet him, so he can bond with you. Before you can even get your French Bulldog’s attention for training you need to make sure that he feels safe and secure with you. Remember, he has just been separated from his mother. A good healthy diet from day one will ensure your French Bulldog is ready for anything that you throw at him! Good quality food will mean a good day’s training! Knowing what you want to train is as important as training your French Bulldog. You can begin training almost immediately, at around six weeks of age. A puppy is a blank slate and does not know any rules, therefore it is a wise idea to make a list and have an understanding of what you would like your puppy to do. What are the household rules and proper dog etiquette? As he grows, the same principle applies and you may adjust training from the basics to more specialized behaviors, such as making your dog a good travel, hiking, agility, hunting, or simply a companion dog. Know what conditions and circumstances you plan to expose your dog or puppy to outside of the household and strategize to be prepared for those encounters by slowly introducing your dog to those situations. Establish yourself as the pack leader from the time you first bring your new dog or puppy home. Being the alpha assists in the training process, and your dog’s relationship with you and your family. Life is much easier for your dog if you are in charge, leading, and providing for his needs. Leading as the alpha assists in the act of working together with your dog towards the goal of understanding the rules of conduct and obedience. Your dog will be at ease when the rules are understood. Training should be an enjoyable bonding time between you and your dog. Remember that there is no set time limit defining when your dog should learn, understand, and then obey commands. Use short training sessions and be aware that if either of you are tired, it is recommended that you stop and try again later. If something does not seem quite right with your dog, in any way, have him checked out by a veterinarian. Timing is crucial when rewarding for good behaviors and making corrections for bad. Patience and Consistency are your allies in the training game. An easy way to avoid the onset of many different behavioral problems is to give your dogs or puppies ample daily exercise to keep them fit and healthy, and destructive behavioral problems at bay. Always provide consistent structure, firm but fair authority, rule enforcement, and importantly, love and affection. By maintaining these things, you will help to create a loyal companion and friend. Reward good behaviors, not for simply being cute, sweet, loveable, and huggable. If you wish to reward your dog, always reward after you issue a command and your dog obeys appropriately. Only train one command per session. Puppies only have the attention span to go about 10 minutes per session, but never exceed 15 minutes. Training a command once per day is enough for your dog to begin to learn and retain, but whenever the opportunity presents itself you should reinforce the training sessions throughout the day. For example, opening a door or putting down a food bowl first command sit, down or stay and be sure not to reward your dog unless your dog obeys. The most important thing to remember is to remain relaxed, keep it fun, and enjoy this time of bonding and training your dog or puppy. All dogs have their own personalities and therefore respond to training differently. No matter the breed that comes with its own characteristics, you need to account for individual personality and adjust accordingly. If needed, do not hesitate to solicit professional help and advice. We all love treats, and so does your dog. Giving your dog a treat is the best way to reinforce good behavior, to help change his behavior or just to make your dog do that insanely funny dance- like-thing he does. Make the treats small enough for him to get a taste, but not a meal, kernel sized. Remember, you do not want him filling up on treats as it might spoil his dinner and interfere with his attention span. – Keep a container of treats handy with you at all times. You do not want to miss a chance to reward a good behavior or reinforce a changed behavior. Always carry treats when you go on a walk. Remember what treats your dog likes most and save those for super special times. In addition, what you consider a treat and what your dog considers a treat are two vastly different worlds. A single malt scotch or chicken wings might be a treat in your mind, but dried liver bits or beef jerky in your dogs. – Ask for something before you give the treat. Tell your dog to sit, stay, or lie down, print two copies of your resume, anything, before you reward your dog with treats, petting, or play. By asking for good behavior, before you give your dog a reward, you demonstrate you are in charge, in an easy fun manner. There is a common misconception that dogs are selfless and wanting to behave only to please out of respect for you. This is horse pucky. This line of thinking is incorrect and detrimental to your success with the training. You have to make sure that your dog knows exactly why he should be listening to you. You are the alpha, the keeper of the treats, the provider of the scratching and the purveyor of toys. Keep this balance of power and the results will be your reward. – Be positive. Think about what you want your dog to do, instead of what you don’t want him to do. Do not send mixed messages. Simply, ignore the bad behavior and reward your dog when he does the action you request to be done. Teach your dog some simple commands to communicate what you want, such as, “drop it,” or “leave it.” – Keep the training sessions short at 15 minutes maximum per session. You will be continuously training your companion, but use the formal training sessions to focus on one objective. Any session longer than 15 minutes will be hard for your dog to stay focused. During training, this is the attention span of most canines. Ten minutes per session is a good time limit for young puppies. Some breeds stay puppies longer than others stay, and may not fully develop until year two. Use a variety and an abundance of different treats and rewards. Rewards are play, toys, praise, affection, treats, and anything that you know that your dog enjoys. Handling Training Teaching your Frenchie to be still, calm, and patient while he is being handled is a very important step in your relationship. When you master this one, it will make life easier for both of you when at home, and either at the groomer or the vet. It also helps when there is unwanted or accidental touching and especially when dealing with small children who love to handle dogs in all sorts of unusual and not so regular ways. This one will take patience and a few tricks to get it started. Remember, it is important to begin handling your new puppy immediately after you find each other and are living together. Understand that muzzles are not bad and do not hurt dogs. They can be an effective device and a great safety feature when your dog is learning to be handled. Easy cheese or peanut butter spread on the floor or on the refrigerator door should keep your puppy in place while he learns to be handled. If your puppy does not like to be handled, he can slowly learn to accept it. You must practice this with your puppy for at least one to three minutes each day so that he becomes comfortable with being touched. All dogs are unique and therefore some will accept this easier and quicker than others will. Handling training will be a life-long process. With all of the following exercises, follow these steps: – Begin with short, non-intrusive gentle touching. If your puppy is calm and he is not trying to squirm away, use a word such as “good,” “nice,” or “yes,” and give your pup a treat. – If your puppy squirms, keep touching him but do not fight his movements, keeping your hands lightly on him while moving your hand with his squirms. When he settles, treat him and remove your hands. – Work from one second to ten seconds where applicable, gradually working your way up to touching for longer durations, such as 2,4,6,8 to 10 seconds. – Do not go forward to another step until your puppy adapts to, and enjoys the current step. – Do not work these exercises more than a couple of minutes at a time. Overstimulation can cause your puppy stress. Continue slowly at your puppy’s comfortable speed. Handling the Body Paws in the clause It is a fact that most puppies do not like to have their paws touched. Proceed slowly with this exercise. The eventual goal is for your puppy to adore his paws being fondled. In the following exercises, any time your puppy does not squirm and try to get away, click and treat your pup. If he does squirm, stay with him using gentle contact, when your pup ceases wiggling, then click and treat, and release when he calms down. Each one of these steps will take a few days to complete and will require at least a dozen repetitions. Make sure you successfully complete each step and your puppy is at least tolerant of the contact before you go on to the next one. – Do each step with all four paws, and remember to pause a minute between paws, allowing your pup to regain his composure. – Pick up your puppy’s paw and immediately click and treat. Repeat this five times and then continue forward by adding an additional one second each time you pick up his paw until ten seconds is reached. – Hold the paw for ten-twelve seconds with no struggling from your dog. Begin with two seconds then in different sessions work your way to twelve. – Hold the paw and move it around. – Massage the paw. – Pretend to trim the nails. Side Note: Do not trim your dog’s nails unless you are positively sure you know what you are doing. It is not easy and it can cause extreme pain to your dog if you are not properly trained. The Collar Find a quiet, low distraction place to practice, grab treats, and put your puppy’s collar on him. – While gently restrained, touch your dog’s collar underneath his chin, and then release him right away simultaneously clicking and treating him. Do this about ten times or until your puppy seems comfortable and relaxed with it. – Grab and hold the collar where it is under his chin and hold it for about 2 seconds, C/T, and repeat. Increase the amount of time until you have achieved about ten seconds of holding and your puppy remains calm. Click and treat after each elapsed amount of time. Work your way up 2,4,6,8 to 10 seconds of holding. This may take several days and sessions. – Hold the collar under his chin and now give it a little tug. If he accepts this and does not resist, click and treat, and repeat. If he squirms, keep a gentle hold on the collar until he calms down, and then C/T and release him. Repeat this step until he is content with it. Now, switch to the top of the collar and repeat the whole progression again. Remember slowly increase the time held and the intensity of the tug using a slow pace. You can pull or tug, but do not jerk your puppy’s neck or head because this could cause injury and interfere with your outcome objectives of the training exercise. You can practice touching the collar while you are treating during training other tricks. Gently hold the bottom or top of the collar when you are giving your dog a treat reward for successfully completing a commanded behavior. From the mouth of dog’s – Gently touch your puppy’s mouth, click and treat, and repeat ten times. – Touch the side of your puppy’s mouth and lift a lip to expose a tooth, click and treat, then release only after he stops resisting. – Gently and slowly, lift the lip to expose more and more teeth on both sides of the mouth, and then open the mouth. Then release when he does not resist, click and treat. Be cautious with this one. – Touch a tooth with a toothbrush, then work up to brushing your puppy’s teeth for one to ten-seconds, and then later increase the time. Brushing your puppy’s teeth is something you will be doing a few times weekly for the lifetime of your dog. The important reason I put this information together is that it is essential to understand why timing and consistency is important, and why clicker training works. If any of this is confusing, do not worry, because I walk you through the training process, step-by-step. Clicker training started over seventy years ago and has become a tried and true method for training dogs and other animals. The outcome of using a clicker is an example of conditioned reinforcement. Rewarding the animal in combination with clicker use has proven highly effective as a positive reinforcement training method. It is a humane and effective way of training dogs without instilling fear for non-compliance. I know that my mother wished she would have known about clicker training when my brother and I were growing up. I am sure she would have put the clicker into action so my brother would place his dirty clothes inside the bin, rather than on the floor. In the 1950s, Keller Breland, a pioneer in animal training, used a clicker while training many different species of animals, including marine mammals. He met great success using this method of training on these animals. His system developed for clicker training marine mammals is still in use today. Keller also trained dogs using the clicker. Because of its effectiveness, it was brought into use by others in the dog training community. Gradually, clicker training for dogs gained more and more popularity and by the early 1980’s its use became widespread. The success of the clicker spans 7 decades and now is a widely accepted standard for dog training. A trainer will use the clicker to mark desired actions as they occur. At the exact instant, the animal performs the desired action, the trainer clicks and promptly delivers a food reward or other reinforcements. One key to clicker training is the trainer’s timing, as timing is crucial. For example, clicking and rewarding slightly too early or too late will reinforce the action that is occurring at that very instant rather than the action you were targeting the reward for. The saying goes, “you get what you click for.” Clicker trainers often use the process of shaping. Shaping is the process of gradual transformation of a specific action into the desired action by rewarding each successive progression towards the desired action. This is done by gradually molding or training the dog to perform a specific response by first, reinforcing the small, successive responses that are similar to the desired response, instead of waiting for the perfect completion to occur. The trainer looks for small progressions that are heading in the direction towards the total completion of the desired action and then clicks and treats. It is important to recognize and reward those tiny steps made in the target direction. During training, the objective is to create opportunities for your dog to earn frequent rewards. In the beginning, it is acceptable to increase the frequency of a C/T to every 3-4 seconds, or less. By gauging the dog’s abilities and improvements, the trainer can gradually increase the length of time between C/T. It is necessary to assess the dog’s progress from moment to moment, adjusting C/T to achieve the desired actionable outcome. During training, and in conjunction with clicker use, the introduction of a cue word or hand signal can be applied. Eventually, the clicker can be phased out in favor of a cue or cues that have been reinforced during the training sessions. As a result, your dog will immediately respond by reacting, obeying, and performing actions to your hand gestures or verbal commands. Watching this unfold is a highly satisfying process, which empowers your friend to be the best he can, and while you have fulfilled your role as alpha and pack leader. Why is clicking effective over using a word cue first? The clicking sound is a unique sound that is not found in nature, and it is more precise than a verbal command. Verbal commands can be confusing because the human voice has many tonal variations, whereas the clicker consistently makes a sound that your dog will not confuse with any other noise. It is also effective because it is directed at him and followed by good things. Therefore, your dog completely understands which action is desired and your dog will quickly understand that the click is followed by a reward. The clicker sound is produced in a quick and accurate way that is in response to the slightest actions that your dog makes. This clarity of function of this tool increases the bond between you and your dog, as a result making your dog more interested in the training sessions, and ultimately your relationship more engaging and entertaining. Dare I say fun? On that note, do not forget to always have fun and add variety to your training sessions. Variety is the spice of life, mix up those treats, rewards, and commands. Clicker training works this way At the exact instant the action occurs, the trainer clicks. If a dog begins to sit, the trainer recognizes that, and at the exact moment the dog’s buttocks hits the ground the trainer clicks and offers the dog a reward. Usually the reward is a small kernel sized food treat, but a reward can be a toy, play, or affection. Whatever the dog enjoys is a reward worth giving. In as soon as 2-3 clicks have been issued a dog will associate the sound of the click with something it enjoys. Once the association is made, it will repeat the action it did when hearing the click. Click = Reward. When this goes off in the dog’s head, repeating the action makes sense. The three steps are as follows: 1. Get the action you request 2. Mark the action with your clicker 3. Reinforce the action with a reward.